The capital of Bavaria is Germany's third largest city with 1.3 million inhabitants. The city hosted the Olympic Games in 1972 and for this occasion the first metro line was built. Since then, Munich has developed one of Europe's best metro networks which together with the S-Bahn serves almost all parts of the city. Munich also boasts an extensive tram network. In the 1950's-60's, Munich, like other German cities such as Stuttgart, Frankfurt, Cologne or Hanover, decided to build underground sections especially in the city centre for its existing tram routes. But before construction started, the city changed its mind in favour of a full metro. In 1964, construction of the first north-south route (now U6) between Kieferngarten and Goetheplatz began. A 600 m long tunnel (at Goetheplatz) built in 1941 for a planned north-south rail tunnel was able to be used. 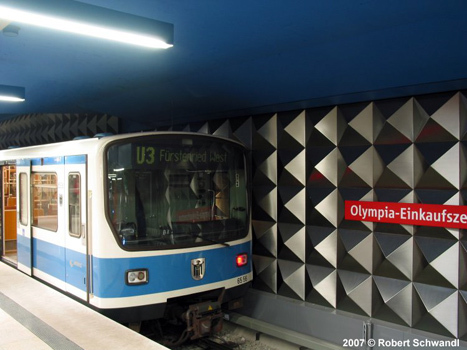 When the city was chosen to host the 1972 Olympics, a branch was planned from Münchner Freiheit to Olympiazentrum (U3). At the same time the S-Bahn tunnel straight through the city centre was built (opened May 1972). In 1971 Munich joined the European metro cities. 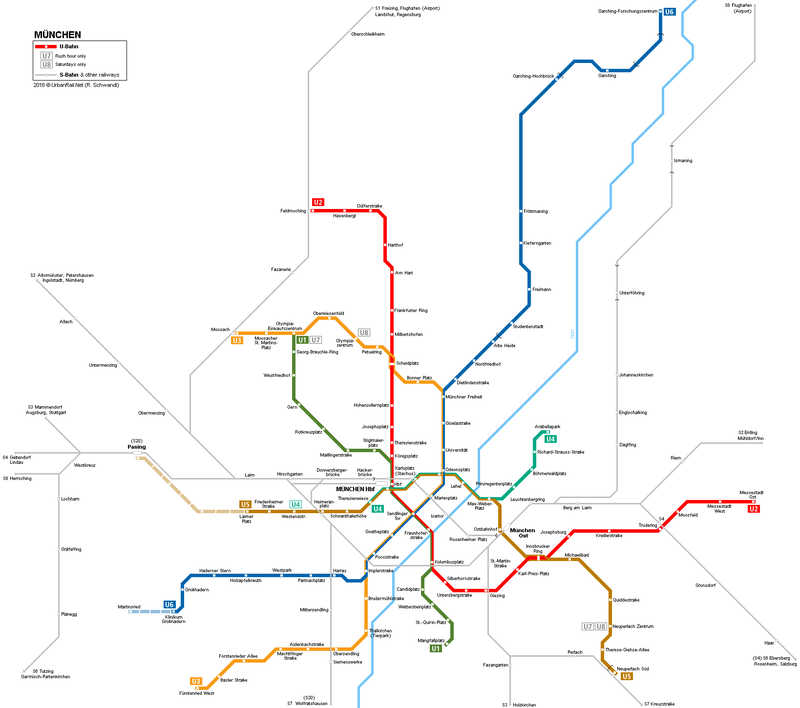 The Munich U-Bahn system is actually a 3-line network with several branches. 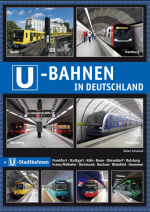 - U5 Neuperlach Süd (0.3 km; sharing platform with single track S-Bahn). The U-Bahn's main depot and maintenance yard is located next to Fröttmaning station on U6, another depot lies just south of Neuperlach Süd. More sidings are distributed all over the network between the running tracks or behind termini. 24 Mar 1988: Laimer Platz - Westendstr. * U4 trains normally end at Theresienwiese, but are extended to Westendstraße during off-peak hours when line U5 only operates every 10 minutes. ** In 1998, Messegelände (former Exhibition Centre - see U2) was renamed into Schwanthalerhöhe. The Munich S-Bahn operated by Deutsche Bahn AG is an important complementary rapid rail service also within the city. All routes have a basic frequency of at least 20 minutes which results in a 3-5 minute interval along the common city route between Pasing and Ostbahnhof. Munich Airport can be reached on two routes, the S8 connects the city centre via Ostbahnhof and Ismaning, a second connection (an S1 branch opened in Nov. 1998) runs on a western route with transfer to U2 at Feldmoching and U3 at Moosach.